For those of you who follow my blogs, you know that I had been in NY for another book event last week. It really is one of my favorite things to do—to connect with my readers and create a dialogue about topics that have meaning to me. I was lucky enough to plan some meetings with some exceptional women during my stay in NY. Pat Mitchell, who is a pioneering woman in every sense, (she was the first woman to become president of PBS and she also organizes TED Women Conferences) extended an invitation for a lunch and an interview at the Payley Center. I had the distinct pleasure of watching Pat interview Nancy Pelosi. Who would have ever thought that a mother of 5 kids decides to run for office in her 40’s and later become the first female speaker of the house? Her story was really inspirational! I did also get a chance to chat with Pat and talk about the many projects that I am working on in the coming year. Dina Powell, the director of Global Corporate Engagement for the Goldman Sachs Group, is another dynamic woman that met with. First of all, when you meet her, you think she should be on the cover of some magazine! She is absolutely stunning and at the same time brilliant. What a combination. Dina leaders the 10,000 women program at Goldman Sachs which helps women start up their dream business all around the globe. As a matter of fact Dina had just come back from a trip to Delhi and was energized by all that was happening in women’s start-ups. I guess you can see that the theme of the week was about strong women. 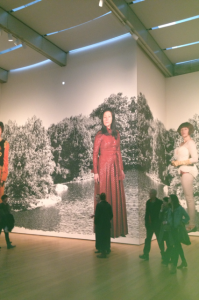 And to cap it off, I made sure I visited Cindy Sherman’s exhibition at the MOMA, which is a must see! For years I have been following Cindy’s work, but I have to admit, I didn’t get some of her photographs. It was only last week, when you see decades of her work, side by side, that you truly grasp the evolution of this gifted artist. And speaking of gifted artists, I paid a visit to the new studio of Shirin Neshat and Shoja Azari. Shirin is indeed a good friend of Cindy’s and I am proud that we have such a prolific artist representing Iranian Women today. Shirin was excited about her upcoming project with Natalie Portman and LVMH for Dior. Her idea for the short film is provocative and insightful. Can’t wait to see it! With all that was happening all around me, my heart was with a dear friend in Los Angeles. Desiree Kohan was a dear friend of mine who had been struggling to stay alive in the face of stage IV cancer for the past seven years. I knew she was not doing well, and I made frequent calls to LA to check in with her. I came back to LA on Wednesday evening, and Thursday morning I was at her side. It pains me to think that such a vibrant and wonderful human being is no longer with us. I hold her deep in my heart for her courage, her relentless grace, and for the light of her soul. These past few days have not been easy to say the least and this Sunday I will speak at her memorial. I am holding her memory close to my heart as she was a spectacular woman.